This renewal of animation from 1999 brings us a whole new set of scenes set to some of the most beautiful and famous pieces of music in the world. It is different in that this brings a more modernized look while still maintaining the classic, original appeal. The film opens with the orchestra setting up while we see flashes of 1940’s Fantasia in the background. It is quite a beautiful sequence of past scenes. Ludwig van Beethoven’s Symphony No. 5 begins as we see paper butterflies and an incredibly drawn scene of vivid colors and a number of butterflies minimizing as fast as they were maximizing. This comes to an end as rays from the sun descend and the butterflies ascend to the sky toward Heaven, bringing home the powerful finish to the musical piece. Steve Martin appears onstage and briefly discusses the original Fantasia. He then introduces Itzhak Perlman who introduces the film’s conductor, Maestro James Levine accompanied by the Chicago Symphony Orchestra. Pines of Rome by Ottorino Respighi begins as whales swim to the light hearted, lovely melody. Seagulls fly above as icebergs dangerously stand below. There is a moment where the main whale of the scene stares through what appears to be a transparent iceberg to gaze at a sea creature about five times its size. The following moment is a bit shocking as the whales begin to fly in the air. As we know, whales do not fly. Abnormal animation sequences are not uncommon for Fantasia and the like, yet it is still surprising to see. George Gershwin’s stunning Rhapsody in Blue begins its telling, beautiful tale as we see a glimpse into everyday life of New York City. The scene accurately and humorously describes the A-type personality of city dwellers as hordes of people rush onto a train and depart to quickly run to their apartments. However, this quickly turns into quite a moving story as we briefly see into the lives of three individuals. A little girl tries her hand at ballet and various other sporting activities and fails at everything she tries; a construction work is bored at his job; and a man seems to be frustrated at the amount of time his wife spends on their dog. They all gaze longingly out of their windows at Rockefeller Center, imagining themselves ice skating with everything feeling right in the surrounding world. Without revealing precisely what happens, we see some brightness shine on their lives. Bette Midler tells us a bit about the animation sequences which did not get put through to the final draft of Fantasia. She then presents Dmitri Shostakovich’s Piano Concerto No. 2 Allegro, Opus 102 to begin the Steadfast Toy Soldier scene. This brilliantly beautiful segment shows the life of a soldier and ballet dancer who quickly and desperately fall in love. A big headed jack in the box stands in their way as he continually attempts to kill the soldier. There is even a highly dangerous moment where the soldier gets knocked out of the building and goes on a mini river adventure with evil rats waiting on a snack. In an amazing twist of fate, he is returned to his original place of residence where he has a final battle with the jack in the box and is finally able to live happily ever after with his love. Next we see James Earl Jones introduce The Carnival of the Animals by Camille Saint-Saens. This is a very short piece but shows us a comical look into the life of your average flamingo who plays yo-yo. Because, as we all know, flamingos play with yo-yos on a daily basis. In this piece, the troublemaker flamingo is hot pink while the others are their natural shade of tropical pink. This is what sets them apart on the wild “goose chase” (so to speak) theming. Penn and Teller then present The Sorcerer’s Apprentice by Paul Dukas, the most famous piece from the original Fantasia film starring the one and only Mickey Mouse. At the end of The Sorcerer’s Apprentice in Fantasia, Mickey Mouse greets Leopold Stokowski. This time, after doing just that, he informs Maestro James Levine that Donald Duck is missing. This brings us to Levine introducing the next piece featuring Donald Duck (he eventually shows up – this seems to be a common trend with him i.e. Philharmagic). The wonderful song we associate with graduation ceremonies called Pomp & Circumstance (Marches 1, 2, 3, and 4) by Sir Edward Elgar provides the music for this Biblical centered scene. We see Noah instruct Donald to round up the animals. The familiar march plays as we see the animals proudly walk up the ramp and into the ark. The flood comes pretty quickly and Daisy, Donald’s flame, is led to assume he did not make it onto the ark. They think the other is dead as we witness a painful few minutes of heartache and close calls of possibly seeing each other. As they exit the ark, they find each other and a rainbow shines overhead, which represents God’s promise to never flood the earth again which is surrounded by the powerful impact of the musical composition. Angela Landsbury introduces the final segment of the film, Igor Stravinsky’s Firebird Suite (1919 version). She states that Walt Disney called the art of animation a “voyage of discovery into the realms of color, sound, and motion.” This is probably the most interesting scene of the film, presenting a wintery background for what is to come. A moose breathes icy air forming a mythical creature to appear. She is a beautiful goddess of sorts who almost looks like an anime drawing. She encounters a twisted rock which destroys everything in its path, wreaking havoc on the surrounding area. She disappears and the moose brings her back. She seems to be quite injured but is able to fly again thanks to her fallen tears which bring new life to flowers (this is very Tangled-esque) and therefore gives her renewed energy. She outstretches across the land and brings brighter color and well-being to the flowers which is reminiscent of the original Fantasia film, where a similar creature floats in the sky to change the color of the sky as the sun sets. The closing credits appear on-screen as we see the orchestra departing and moments from the film play in the background. The live action sequences are hosted/presented by the aforementioned individuals. Fantasia 2000 is directed by eight incredibly talented individuals. Gaetan and Paul Brizzi direct the Firebird Suite. James Algar directed The Sorcerer’s Apprentice segment. Hendel Butoy directs Pines of Rome and Piano Concerto No. 2 while Francis Glebas brings us Pomp and Circumstance. Eric Goldberg gave us Rhapsody in Blue and The Carnival of the Animals while Pixote Hunt took care of Symphony No 5. Finally, Don Hahn directed the host sequences in-between the animated segments. 1.) This was released just after midnight on Dec. 31st 1999, causing it to be the first film to be released in the new millennium. 2.) George Gershwin is featured in the Rhapsody in Blue segment. He is seen playing a piano in his apartment window above where the little girl known as Rachel is seen during her piano lesson. 3.) The Steadfast Tin Soldier scene was slated to appear in the original Fantasia but no one came to a decision as to what music should be used for it. 4.) One of the animals marching into the ark is a frilled lizard which was featured in The Rescuers Down Under. 5.) The Firebird Suite contains an eruption of volcanos which is made to emulate the eruption of Mount Saint Helens in 1980. My favorite scene in this film is the entire Pomp and Circumstance segment. I’ve always been a huge fan of the graduation march. It is one of those compositions which never fails to bring tears to my eyes. Francis Glebas did an incredible job directing this piece, beautifully matching the characters’ actions to each rise and fall of the melody. 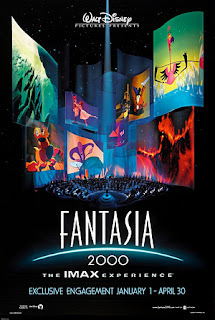 Fantasia 2000 is somewhat similar to and somewhat different from Fantasia. The newer film brings more of an edge and delves a little deeper into darker tones of animation. It is extremely fun and will definitely be enjoyed by individuals of all ages. This comes highly recommended by many people, including myself. Oh, and camera back on me. Camera back on me. Ca... Am I done? Hey do u guys have a Email or a Google Voice ? A nice companion film to the orginal "Fantasia" and I wouldn't mind they do a third film.